I’ve never thought of myself as the kind of person to pick a fight. I do like to deeply engage with ideas, of course, and I prefer to engage in arguments that are well-supported with evidence and reasoning. And of course I can spot and attack “gee-whiz” marketing hype from 500 yards. But no one I know has called me a mama grizzly. And I’ve never been someone to bludgeon someone over the head with my own ideas. Like any academic, I do like to talk about my work– but I also like to ask questions. I aim to learn from others, even when their viewpoints are very different from my own. But when I read a recent issue of the Journal of Broadcasting and Electronic Media, it simply made my blood boil. Jim Potter’s invited essay for this important and well-respected journal claims in its title to depict the state of media literacy. But it omits so much of the innovative and important work that has emerged in the last ten years from scholars across the fields of communication, education and public health. My grad students, colleagues and Labsters will remember that week — I could hardly believe Potter’s essay had been published. I simply went ballistic! I pounded out a rejoinder (in a verbal body slam of sorts) and e-mailed it off to the journal. What made me see red? By conceptualizing media literacy primarily as a response to counteract the negative effects of mass media and popular culture, Potter’s vision of media literacy mischaracterizes the field. At a time when more and more stakeholders are embracing the depth and complexity of media literacy, Potter publishes a narrow little piece that boxes media literacy into a wee corner of the media effects tradition. Yikes! Let’s set the record straight. Jim Potter has long had a rather ambivalent relationship with the larger community of media literacy educators and scholars. He’s published a best-selling textbook titled, Media Literacy and another book titled, The Theory of Media Literacy. But he’s never participated in the discourse community of media literacy scholars. To my knowledge, he’s never attended a media literacy conference— and there have been dozens and dozens of them over the past 15 years. We travel in different circles, I guess you might say. Unfortunately, some communication scholars still see media literacy simply as a minor variant within the media effects tradition precisely because Jim Potter has carefully positioned it there– not as a field of inquiry, a place of advocacy, an innovative pedagogy, or a community education movement, but simply as an antidote to all manner of negative media effects, including media violence, materialism, stereotyping and much more. I thought this argument was nearly over in 1998, when I thought I had nailed the coffin on this issue by identifying it as one of the seven great debates. Jim’s going to publish a response to my critique of his essay, as well he should. Maybe we will get a chance to duke it out at ICA, NCA, BEA or AEJMC. 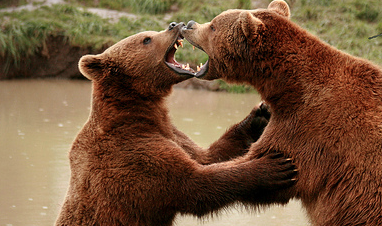 Two big ol’ bears growling at each other– it could be crowd-pleasing fun! But special thanks are owed to Susan Brinson at the Journal of Broadcasting and Electronic Media, who accepted it for publication. You can read my critique of Potter’s essay by clicking here.